Have you ever felt like you’re spending more time taking care of a busted printer or a finicky IT network than you are actually running your business? We can imagine that it’s a frustrating and stressful experience. 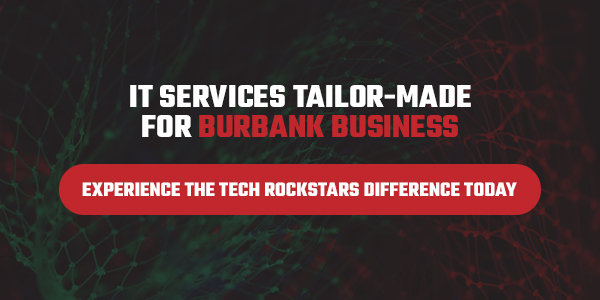 That’s why the Tech Rockstars are here to help your small business in Burbank get back to doing what it does best. With our complete suite of managed IT services, you can concentrate on what you do best, while we do the same. The reality of modern business practices is that you now rely on a network of computers to do the majority of your work now. Every industry in the world is increasingly relying on the power that computers bring to business. Of course, with this change in the way we do business means that we’re also experiencing new challenges and complications. Network failures can prevent your business from communicating internally and externally, stymying the flow of ideas to the right parties. Even the smallest crack in your cybersecurity armor can result in attacks from hackers and other malicious groups. When your technology and IT infrastructure is down, your employees can’t carry out the work that helps your business grow. The longer these problems go unaddressed, the worse off your business is. If you’re new to the field of IT, or you’re simply to busy with other projects to handle it, there’s no reason you shouldn’t work with a managed IT service. We can alleviate your IT concerns and proactively respond to problems and challenges you might face. We’ve developed a broad array of services and products that make it easy to take care of you and your business. Don’t settle for the cookie cutter, “one size fits all” approaches our competitors offer. You deserve an IT experience that is tailored to the needs of your business. Whether that’s having an IT specialist on-site taking care of an issue, or simply having us work behind the scenes, we can do it all. The security of your data is paramount. That’s why we have spam filters and cybersecurity measures that keep malicious hackers and malware out of your IT networks. On top of that, we can set you up with a data backup and recovery service that ensures you always have access to the important information that drives your business. Burbank is made up of dozens of businesses of all sizes and fields. It’s this dynamic array of companies, institutions, and startups that make the city what it is. Tech Rockstars is proud to work with many of them and in many industries. Our tailor-made approach ensures we can help you no matter what your business does. We also specialize in a few fields. Over the years, we’ve developed products and services that work especially well in fields like healthcare and dental services. We also are happy to work with other specialized fields like legal practices and accounting firms. If you work with highly sensitive and private information, we’re the ones to call to keep it safe. We offer hosting services for servers, email exchanges, and more. Whatever your business in Burbank needs, we can support it. Ready to experience the Tech Rockstars difference? Get started by contacting us for a free quote!